We left off at Skye's adventure in Central Park. Where to next? After our fantastic horse and carriage ride we all boarded the Pixie party bus where we were all whisked off to our next location. Where you ask? 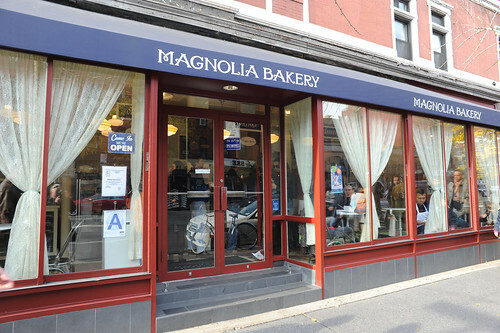 Only one of the most fabulous bakeries in all of NYC, Magnolia Bakery. Why Magnolia? 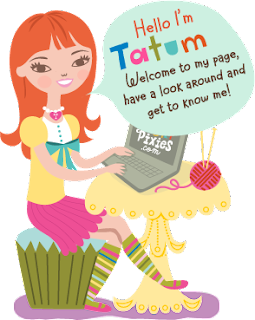 Pop Art Pixie Tatum loves to bake, entertain and have fun. 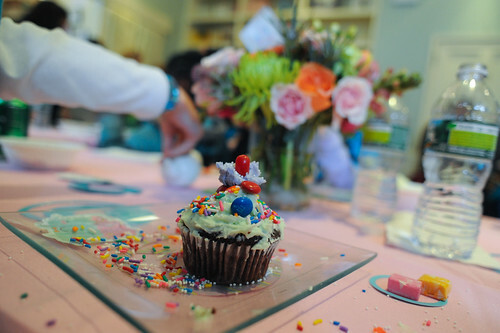 What a better place to throw a party than at a cupcake palace in her honor? Drama Queen, Miss N. and Miss E. inspecting their plates in preparation of cupcake makin' fun. Here the girls and I learned how to properly frost a cupcake - just let me say that I have been doing this ALL wrong. Here is a little video Crayola posted of the frosting fun we had inside (minus the cupcake frosting top secret tutorial). If you note Miss E. strangely inspecting the creamer, it is because they were filled with M&M's Note the fantastic personalized plates we were eating our cupcakes off of - these were one of our creations from our crafty evening the night before. Here the girls demonstrate their new skills - (both had "hat head" from wearing their new hats all over NYC). I used to be an avid beader - I even know how to do actual hand beading. I prefer simple projects but can also do more complex beadwork. Because I am also into blogging, reading, writing, film and sweepstaking in addition to all of the kids activities (which come first), that does not leave much time for anything else. I did recently get the urge to break into my craft supply and whip something up. I did 2 pairs of earrings - one to go with a necklace I made over a year ago and the other that I had been trying to figure out what to do with these beads that I loved but had not figured out how to purpose them in a finished piece. The necklace is composed of champagne colored glass pearl beads, teal crystal faceted rounds, teal crystal bicones and pink Czech faceted rondelle glass accents. Bronze daisy spacers also give some added dimension. The matching earrings are made with the champagne colored glass pearls but are accented with the bronze daisy spacers, iridescent seed beads and bronze crystal bicones. Hopefully I will have more pictures to share soon! Miss N. and Miss E.
One of the beautiful Reliefs in Central Park at Bethesda Bridge. 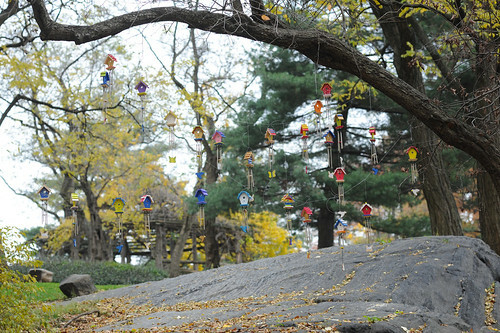 This was my favorite part of the park - there were so many to marvel over! Anne taking a breather with Miss E.
Miss E. and Miss N.
Drama Queen, Miss E. and Miss N. loving our horse - the girls named him "Chip". Each pixie has their own interests so girls can relate to the pixie that most closely represents them. Like me Skye loves Nature. Also like me she is a Gemini, loves folk music, haiku poetry, reading, word games and recycling and dark chocolate. Hey are we sure we are talking about Skye here and not me? Miss N. relates to Skye because she is an outdoorsy, green girl. On the pink carpet you can see Miss N. vehemently claiming that Skye is her favorite Pixie! You can meet ALL of the pixies HERE. Mine is the white and blue one on the bottom in the middle. 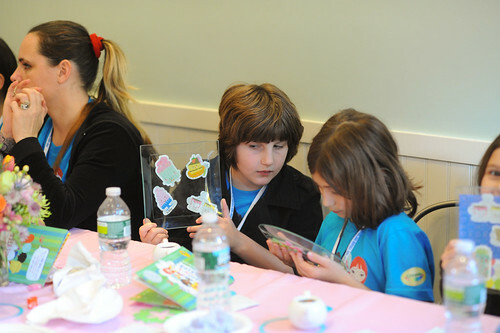 Yes, the moms were allowed to partake in the Arts and Crafts fun too! 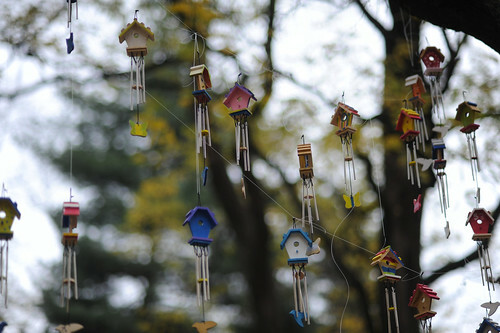 Done ooohing and aaahing over our beautious wind chimes? OK, So back to our mystery location. Now where would an outdoorsy gal like Skye go in NYC? hmmm. Any guesses? I think this is an easy one. How about Central Park? Of course! Yes, this is where our artwork was so proudly and creatively displayed!